You may not have heard of him yet, but Snacktime the famous dog hero will become a household name when his heroic tale of heroism is brought to the silver screen by director Sanford McRotchis-Red. 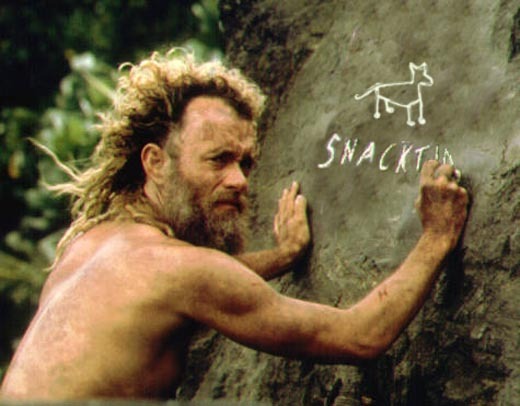 The part of Snacktime will be played by none other than Tom Hanks (Joe vs. The Volcano). Hanks has been known to take extreme measures when preparing for a part-- loosing 50 lbs to play Chuck Noland in Castaway, and 500 lbs to play Sergeant Negative in The Invisible and Physically Impossible World of Sergeant Negative. To play the role of Snacktime, he has been trying to reenact some of the dog hero's famous heroisms. He shares his experiences thus far. "In his autobiography HeroLife, DogLife Snackie-T describes the time he saved an elderly child from a bullet. I tried to recreate this scenario last weekend, but only a few of the test children survived..." Hanks trailed off into agi-tears®, a new type of agitated crying he invented to mimic Snacktime's superhuman emotions. Many have questioned McRotchis-Red for casting a human to play a dog, but he will not be dissuaded. "With computers, anything is possible!" he said, and refused to elaborate. We can only guess that Hanks will be turned into a dog by some sort of "Xtreme-power Super GraphiX Mainframe" computer. We can't wait.